Aloe vera, angelica, anise, autumn crocus, barberry, basil, bay, black cohosh, caraway, cayenne, elder, fennel, feverfew, golden seal, hyssop, juniper, male fern, mandrake, parsley, penny royal, poke rosemary, root, rue, sage, southernwood, tansy, tarragon, thuja, thyme, wintergreen, wormwood, yarrow. This is not comprehensive list and during pregnancy you should check with a trained herbalist or pharmacist before taking any herbal preparation - as you should with any medical preparation at all. It is advisable to avoid all herbs during the first three months of pregnancy. There are many medical conditions that preclude the use of certain herbs. These include asthma, diabetes, high blood pressure, epilepsy and heart disease. 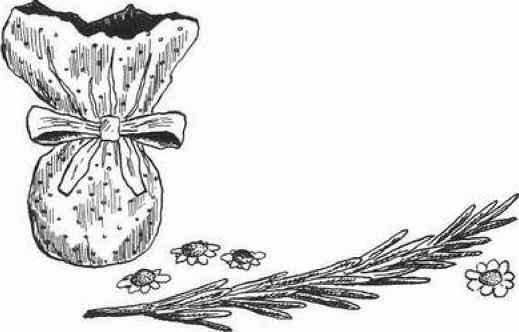 Generally, of course, it should be safe to use your herbs in sachets or poppets, but you must avoid inhaling the herbs. Mild herbs, such as rose, lavender and Chamomile or hops, are safe options for use in sleep pillows. However, in all cases, you should consult a qualified medical practitioner before using herbs in any form.